Fife pair Mary Malcolm and Helen Thomson won the 2010 Commonwealth Spoons final over a very windy Cathkin Braes Golf Course today (Thursday 21 October). Mary and Helen shot a nett score of 74 to pip their County colleagues, Lorna Fury and Marie Curran by one shot. 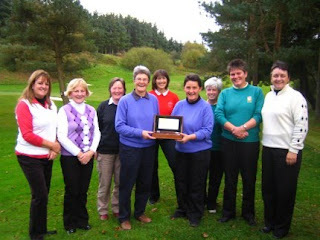 Pairs from all fifteen Scottish County Golf Associations were represented in the final. This two ball Foursomes event was postponed from September 23 when the course was flooded and the SLGA is very grateful to Cathkin Braes for allowing the competition to be rescheduled.